Gill, Thomas Hornblower, was born at Bristol Road, Birmingham, Feb. 10th, 1819. His parents belonged to English Presbyterian families which, like many others, had become Unitarian in their doctrine. He was educated at King Edward’s Grammar School under Dr. Jeune, afterwards Bishop of Peterborough. He left the school in 1838, and would have proceeded to the University of Oxford, but was prevented by his hereditary Unitarianism (long since given up), which forbade subscription to the Articles of the Church of England then necessary for entrance to the University. This constrained him to lead the life of an isolated student, in which he gave himself chiefly to historical and theological subjects. Hence his life has been singularly devoid of outward incident; and its interest gathers about his hymns, and the seasons of overmastering thought and feeling which gave them birth. The only events that can be chronicled are the publications of his books (see below). (1) The Fortunes of Faith, 1841; (2) The Anniversaries (Poems in commemoration of great Men and great Events), 1858; (3) The Papal Drama (an historical essay), 1866; (4) The Golden Chain of Praise Hymns by Thomas H. Gill, 1869; (5) Luther’s Birthday (Hymns), 1883; (6) The Triumph of Christ (Memorials of Franklin Howard), 1883. 1. Ah tremblers, fainting and forlorn. Eternal Youth. Written in 1868, and first published in his Golden Chain, &c, 1869, p. 149, in 9 stanzas of 4 lines. In 1873 Martineau gave stanzas iv.-ix. in his Hymns, &c, No. 256, as, “Young souls, so strong the race to run.” These were repeated in the Baptist Hymnal, 1879, as No. 862. 2. Alas the outer emptiness. Consecration of the Heart. Contributed to G. Dawson’s Psalms & Hymns, 1846, No. 121, in 7 stanzas of 4 lines. It was introduced to the American Unitarian collections through Hedge & Huntington’s Hymns for the Church of Christ, 1853, No. 619. 3. Alas these pilgrims faint and worn. Whitsuntide. Written in 1853, and first published in his Anniversaries, 1858, p. 73, in 11 stanzas of 4 lines, then in G. Dawson’s Psalms & Hymns, 1862, the Golden Chain, &c, 1869, p. 107, &c.
4. Alone with Thee, with Thee alone. Worship in Solitude. Written in 1856, and first published in his Golden Chain , &c, 1869, p. 26, in 8 stanzas of 4 lines. 5. And didst thou, Lord, our sorrows take? Passiontide. Written in 1849, and published in his Golden Chain, &c, 1869, p. 45, in 6 stanzas of 4 lines. It is in several English collections. 6. Behold the everlasting Son. Ascension. Written in 1862, and first printed in the Hagley Magazine, and then in G. Dawson’s Psalms & Hymns, 1862, and the Golden Chain, 1869, p. 47, in 8 stanzas of 4 lines. 7. Break, newborn year, on glad eyes break. New Year. Written in 1855, and first published in his Golden Chain, &c, 1869, p. 144, in 6 stanzas of 4 lines. It is one of the most popular of the author’s hymns, and is found in many collections. 8. Bright Presence! may my soul have part. Witness of the Spirit. Written in 1849, and first published in his Golden Chain, &c, 1869, p. 100, in 8 stanzas of 8 lines. It is repeated in The Songs of the Spirit, N. Y., 1871. 9. Bright Thy presence when it breaketh. Public Worship. Written in 1856, and first publised in his Golden Chain, &c, 1869, p. 27, in 6 stanzas of 6 lines. In the Baptist Hymnal, 1879, and in Dale’s English Hymnbook it is in an abridged form. 11. Dear Lord and Master mine. Resignation. Written in 1868, and first published in his Golden Chain, &c, 1869, p. 162, in 7 stanzas of 4 lines. It is in somewhat extensive use both in Great Britain and America. 12. Dear Lord, Thou art not sorry. Passiontide. Written in 1866, and first published in his Golden Chain, &c, 1869, p. 58, in 5 stanzas of 8 lines. 13. Dear Lord, Thy light Thou dost not hide . Christian Labours . No. 125 in the Golden Chain, &c, 1869, p. 178, in 8 stanzas of 4 lines on the text, “Let your light so shine before men,” &c, and was written in 1855. 14. Do we only give Thee heed . Jesus the Gladdener of Life. Written in 1849, and first published in G. Dawson’s Psalms & Hymns, 1853; and again in the Golden Chain, &c, No. 145, in 6 stanzas of 6 lines. In use in Great Britain and America. 15. Embrace your full Salvation. Heaven. Written in 1870, and first printed in The Congregationalist, 1873, in 9 stanzas of 8 lines. On including it in his English Hymnbook, 1874, Dr. Dale transposed some of the stanzas. 16. Farewell, delightful day. Sunday Evening . Written in 1867, and published in his Golden Chain, &c, 1869, No. 19, in 9 stanzas of 4 lines. In the Church Praise Book, N. Y., 1882, st. i., viii., ix., are given with the alteration of the opening line as, “Holy, delightful day.” Dr. Hatfield, in his Church Hymnbook, N. Y., 1872, has the same opening, but he omits stanzas iv.-vi. of the original. 19. Full many a smile, full many a song. Joy in God the Father. Written in 1854, and first published in his Golden Chain, &c, 1869, No. 8, in 9 stanzas of 4 lines. In Dale’s English Hymn Book, 1874, No. 21, st. ii., which applied personally to the author alone, was omitted. 21. How, Lord, shall vows of ours be sweet? Public Worship. The author’s earliest hymn. It was written in 1845, and first published in G. Dawson’s Psalms & Hymns, 1846, No. 114, in 6 stanzas of 4 lines, and again in the Golden Chain, &c, 1869, No. 2. It is in several American hymnbooks. 24. Let bolder hearts the strife require. Prayer against Temptation. No. 218 in Martineau’s Hymns of Praise and Prayer, 1873. It was written in 1851, and first published in the Golden Chain, &c, 1869, in 7 stanzas of 4 lines. 25. Lift thy song among the nations. National Hymn. Written in 1853, and first published in G. Dawson’s Psalms & Hymns, 1853, in 4 stanzas of 8 lines. When repeated in the Golden Chain, &c, 1869, No. 62, an additional stanza (iii.) was given, and it was entitled “England’s Hymn.” It is a spirited hymn and worthy of greater circulation than it now has. The 1869 text is given in Dale’s English Hymn Book, 1874, No. 1239. 27. Lord, comes this bidding strange to us ? Invitation to Rejoice. Written in 1849, and first published in his Golden Chain, &c, 1869, No. 144, in 11 stanzas of 4 lines. 28. Lord, dost Thou ne’er Thy servants bless? Free Grace. Written in 1855, on the words of Oliver Cromwell as used by him in a letter to his “beloved cousin Mrs. St. John,” dated “Ely, 13th October, 1638. “Truly no poor creature hath more cause to put him self forth in the cause of his God than I. I have had plentiful wages beforehand; and I am sure I shall never earn the least mite.” (Carlyle’s Oliver Cromwell’s Letters and Speeches, &c, Letter ii.) The hymn was first published in the Golden Chain, &c, 1869, in 9 stanzas of 4 lines. 29. Lord, from Thee, what grace and glory. National Hymn. This cento in Vince’s Collection, 1870, No. 450, is from the poem, on St. George’s Day, written in 1853, and published in the author’sAnniversaries, 1858, p. 47. 30. Lord, from these trembling souls of ours. Praise. Composed in 1859, and first published in his Golden Chain, &c, 1869, No. 3, in 10 stanzas of 4 lines. 31. Lord God, by Whom all change is wrought. God Eternal. Written in 1869, the keynote being the words of St. Augustine, “Immutabilis mutans omnia,” and first printed in the Songs of the Spirit, N. Y., 1871. In 1874 it was included in Dale’s English Hymn Book; and, in 4 stanzas, in the Baptist Hymnal, 1879. 32. Lord God of old, who wentest. Public Worship. Composed in 1868, and first published in his Golden Chain, &c, 1869, No. 30, in 5 stanzas of 8 lines. 33. Lord, if our dwelling place thou art Communion of Saints. Written in 1856, and first published in his Golden Chain, &c, 1869, No. 150, in 8 stanzas of 4 lines. The hymn, “Death has no bidding to divide,” in Dale’s English Hymn Book, 1874, begins with stanzas ii., and omits stanzas i., iv. of this hymn. 34. Lord, in this awful fight with sin. Victory through Christ. Written in 1857, and first published in his Golden Chain, &c., 1869, No. 128, in 7 stanzas of 8 lines. 35. Lord, in Thy people Thou dost dwell. Unity of Christ and His people. Written in 1864, and first published in his Golden Chain, &c, 1869, in 12 stanzas of 4 lines. 36. Lord, Thou hast been our dwelling place. National Hymn. “Begun among the Waldenses, 1864,” and first published in his Golden Chain, &c, 1869, No. 59, in 8 stanzas of 7 lines, entitled, “The hymn of the Waldenses,” and supplemented with the note, “This hymn as a whole belongs to the Waldenses only, among whom it was begun, but all the people of God have an interest in the first two and the last verses.” Acting upon this suggestion of the author, these stanzas were given in the Supplement to the New Congregational, 1869, as No. 1025. 37. Lord, Thou wouldst have us like to Thee. Holiness desired. Written in 1846, and first published in G. Dawson’s Psalms & Hymns, 1846, No. 120, in 8 stanzas of 4 lines. It is in several American collections. 38. Lord, Thy gracious voice hath spoken. Christ our Caesar. Written in 1849, and first published in G. Dawson’s Psalms & Hymns, 1853; and again in the Golden Chain, &c, 1869, in 3 stanzas of 8 lines. 39. Lord, when I all things would possess. Humility. Written in 1850, and first published in his Golden Chain, &c, 1869, No. 111, in 8 stanzas of 4 lines. In Martineau’s Hymns, &c, 1873, No. 304, stanzas ii., iv., vii. are omitted. This hymn is also in common use in America. 40. Lord, when we come at Thy dear call. The Holy Ghost, the Sanctifier. No. 72 in his Golden Chain, 1869, in 7 stanzas of 4 lines, was written in 1856, and is given in the Songs of the Spirit, N. Y., 1871. 41. May we not, Father, meetly mourn? Burial. No. 151 in his Golden Chain, &c, 1869, in 9 st. of 4 lines, was written in 1855. 43. My God, I do not flee from Thee. Joy. Written in 1849, and first published in his Golden Chain, &c., 1869, No. 10, in 7 stanzas of 4 lines. The New Congregational, 1369, No. 1119, begins with stanza ii., “Father, Redeemer, Quickener mine,” and also omits stanza iv. 44. My God, my Majesty divine. Child of God. Written in 1845, and first published in G. Dawson’s Psalms & Hymns, 1846, No. 116, in 8 stanzas of 4 lines, and again, after revision, in the Golden Chain, &c, 1869, No. 135. The original text is in common use in America. 45. Not, Lord, Thine ancient works alone. Public Worship. Written in 1874, and first printed in The Congregational, in 6 stanzas of 6 lines, and entitled, “The Living God.” In Dale’s English Hymn Book, 1874, st. iii. is omitted. 46. Not yet I love my Lord. Lent. Written in 1868, and first published in his Golden Chain, &c, 1869, No. 86, in 9 stanzas of 4 lines. It is in several collections, including Martineau’s Hymns, &c, 1873, No. 199. 47. Not yet, ye people of His grace. Here and Hereafter. A hymn on the “The Vision Beatific,” No. 165, in his Golden Chain, &c, 1869, in 11 stanzas of 4 lines. It was written in 1866, and is in American common use. 48. 0 height that doth all height excel. Written in 1853, and “was born of the words of Augustine in the outset of the Confessions, ‘Secretissime et Praesentissime,’ and was the first of several hymns inspired by his wonderful antitheses about God.” It was first published in G. Dawson’s Psalms & Hymns, 1853, and again in the Golden Chain, &c, 1869, No. 13, in 9 stanzasof 4 lines. It is in English and American common use. 49. 0 Holy Ghost, Who down dost come. Whitsuntide. “Written at Malvern on Whitsunday, 1863; a day of singular spiritual enjoyment, and outward loveliness.” It was first published in the Golden Chain, &c, 1869, No. 74, in 1 stanza of 4 lines, and headed, “A Breathing after the Holy Spirit,” and is in several collections. In Martineau’s Hymns, &c, 1873, No. 251, it begins with st. ii., “Spirit of Truth, Who makest bright,” st. i. and vi. being omitted. 50. 0 not alone in saddest plight. Divine Guidance desired. Composed in 1856, and first published in his Golden Chain, &c, 1869, No. 120, in 9 stanzas of 4 lines. 51. 0 not to fill the mouth of fame. A Servant of Christ. “Composed in 1849, and printed first in a small collection of poems entitled, I think, “The Violet.” In 1853 it was given in G. Dawson’s Psalms & Hymns; and in 1869, in the Golden Chain, &c, No. 121, in 6 stanzas of 4 lines. Its use is mainly confined to America. 52. 0 not upon our waiting eyes. Divine Love. Written in 1849, and first published in his Golden Chain, &c, 1869, No. 29, in 5 stanzas of 4 lines. 53. 0 saints of old, not yours alone. Seeking God. Written in 1848, and first published in G. Dawson’s Psalms & Hymns, 1853; and again, after revision, in the Golden Chain, &c, 1869, No. 126, in 10 stanzas of 4 lines. The American hymnbooks have usually the original text, but in Dale’s English Hymn Book , 1875, and Holder’s Congregational Hymn Book1884, the text is abridged from the Golden Chain. 54. 0 smitten soul that cares and conflicts wring. Heaven desired. Written in 1854, and first published in his Golden Chain, &c, 1869. No. 75, in 8 stanzas of 4 lines. 55. 0 Spirit, sweet and pure. Constant Presence of the Holy Spirit desired. Written in 1868, and given in his Golden Chain, &c, 1869, as No. 127, in 7 stanzas of 8 lines. 56. 0 time, ne’er resteth thy swift wing. Worth of Time. Written in 1855, and first published in his Golden Chain, &c, 1869, No. 98, in 9 stanzas of 4 lines. 57. 0 wherefore hath my spirit leave? Spiritual Changes. “Composed with great ardour and stir of soul in 1847, and first printed in the Golden Chain, 1869,” No. 85, in 7 stanzas of 4 lines. 59. Saviour, needs the world no longer! Christ All in All. “Written in 1847… it was inspired partly by my contemplation of Shelley’s hapless, Christless life.” It was first published in G. Dawson’s Psalms & Hymns 1853, and again in the Golden Chain, &c, 1869, No. 35, in 7 stanzas of 6 lines, and headed, “Lord, to whom shall we go.” Its use is limited, and far less than its merits deserve. 60. Saviour, Who from death didst take. The Resurrection of Christ, a cause of Confidence. Written in 1856, and first published in his Golden Chain, &c, 1869, No. 96, in 5 stanzas of 6 lines. 61. Sweet Spirit, would Thy breath divine. The Holy Ghost, the Purifier, desired. Written in 1856, and given as No. 71 in his Golden Chain, &c, 1869, in 10 stanzas of 4 lines. 62. The happy fields, the heavenly host. Heaven. Written in 1848, first published in G. Dawson’s Psalms & Hymns, 1853, and again in the Golden Chain, &c, 1869, No. 157, in 10 stanzas of 4 lines. 63. Thy happy ones a strain begin. Joy in God. Written in 1846, and published in G. Dawson’s Psalms & Hymns, 1846, No. 118, in 5 stanzas of 4 lines. In the Golden Chain, &c, 1869, No. 146, the text is slightly changed. The text in common use in Great Britain and America is from the original. 64. Too dearly, Lord, hast Thou redeemed. Lent. Written in 1855, and first published in his Golden Chain, &c, 1869, No. 97, in 9 stanzas of 4 lines. 65. Unto thy rest return. Lent. Written in 1866, and first published in his Golden Chain, &c, 1869, No. 92, in 6 stanzas of 8 lines. 67. We triumph in the glorious grace. Citizens of Heaven. Written in 1855, and first published in his Anniversaries, 1858, and again in his Golden Chain, &c, 1869, No. 153, in 12 stanzas of 4 lines. 68. What sweetness on Thine earth doth dwell. Nature revealing God. [Summer.] Written in 1850, and first published in his Golden Chain, &c, 1869, in 8 stanzas of 4 lines. 69. When shall I, Lord, a journey take. Lent. Written in 1856, and first published in his Golden Chain, &c, 1869, No. 80, in 8 stanzas of 4 lines. It is in common use in Great Britain and America. 70. Whence this naming joy that maketh! The Prodigal’s Return. “Written in 1853 just before the hymn beginning ‘Thrice blessed soul, who still hath made,’ with the text ‘Son, thou art ever with me’ (Golden Chain, No. 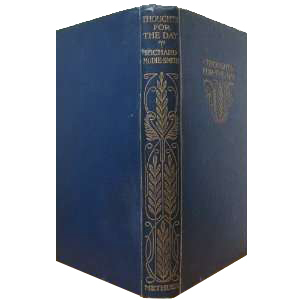 134), which is its completement; and first printed in the Golden Chain,” 1869, No. 81, in 6 stanzas of 6 lines. 71. Would the Spirit more completely? The Gifts of the Spirit. Written in 1849, and first published in G. Dawson’s Psalms & Hymns, 1853; and again in the Golden Chain, &c, 1869, No. 67. in 3 stanzas of 8 lines. 72. Ye children of the Father. Spiritual Worship. Written in 1867, and first published in his Golden Chain. &c, 1869, No. 23, in 6 stanzas of 8 lines. 73. Ye of the Father loved. Praise. Written in 1862, and first published in the Golden Chain, &c, 1869, No. 5, in 8 stanzas of 8 lines. 74. Ye people of the Lord, draw near. Holy Communion. Written in 1855, and first published in his Golden Chain, &c, 1869, No. 127, in 7 stanzas of 4 lines. 75. Ye souls, the Father’s very own. Holy Diligence. Composed in 1867, and first published in his Golden Chain, &c, 1869, No. 142, in 9 stanzas of 4 lines. These hymns are usually abridged in the hymnbooks, the length of most of them being against their use in their full form. Although they are gradually growing in popular esteem, the extent of their use is much more limited than their merits deserve. Gill, T. H. , pp. 421-3. Additional hymns to those annotated are in common use:—(l) “O dreadful glory that doth make,” a cento from No. 48, p. 423, ii. ; (2) “O mystery of Love Divine ” (The Love of Christ); (3) ” Ye souls for whom the Saviour died” (Electing Love). These are all from his Golden Chain of Praise, 1869. 1. Ah! wherefore fall my tears so fast? [The World Overcome.] Published in his Golden Chain of Praise, 1869, p. 167. The hymn, “O Thou for Whom the strife was strong,” in the American Hymns for Church and Home, 1895, is composed of sts. iii.-vii. of this hymn. 2. Dear Lord, Thou bringest back the morn. [Morning.] From his Golden Chain of Praise, 1869, p. 145. 3. I would not give the world my heart. This, in the Amer.Baptist Sursum Corda, 1898, No. 379, is a cento from “With sin I would not make abode,” p. 1288, ii. 4. Not only when ascends the song. This in the Amer. Hymns of the Ages, 1904, No. 80, is a cento from “0 Saints of old, not yours alone,” p. 423, i. 53. 5. Walk with the Lord! along the road. Composed of sts. v., vii.-ix., of “Ah ! tremblers, fainting and for¬lorn,” p. 421, ii. 1. Included in the American Unitarian Hymns for Church and Home, 1895. 6. We would not dare their bliss to mourn. This in the Amer.Unit. Hymns for Church and Home, 1895 is composed of sts. v.-viii. of “May we not, Father, meetly mourn?” p. 422, ii. 41. 7. Wherefore faint and fearful ever. [ God is for us.] Published in the 2nd edition of his Golden Chain of Praise, 1894, No. xiii., in 7 stanzas of 6 lines, and dated 1880. In Hymns Ancient & Modern, 1904, in 5 stanzas. The cento “He Who suns and worlds upholdeth,” is composed of stanzas ii., iii., and vii. of the original hymn. Mr. Gill died in 1906.